Flat parts are placed on a flat surface with holes facing up. For odd-shaped parts, or very small parts, a simple nest is often used. For good holes the Unit will self-reverse, and flash a green light. For bad holes (undersized or blocked thread; short threads or no threads) the Unit’s spindle will stop and a red light will flash. Compliant toolholders eliminate the annoyance of false rejects when alignment is not perfect. The TVS-SV employs New Vista’s patented technology which means you have preset torque for entering the part and full torque for backing out. 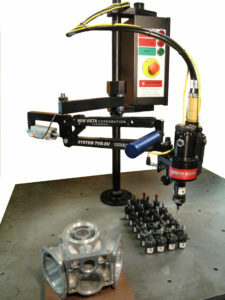 This eliminates the possibility of damaged threads and jammed gage members. The TVS-SV also features New Vista’s Quick-Change Toolholders, so gage changing can be done in seconds. With these, several different thread sizes can be checked on the same part with minimal effort and time. The TVS-SV is not expensive; and they are always in stock, so delivery is fast. If you are interested in these Units, give us a call or send an email. If you will want to see a video of a TVS-SV running your part, send us one or two of the parts and we will make the video for you.